Grunewald was born in the 1470s but his exact date of birth is unknown. Details of his life are quite sparse, even his name is the subject of speculation and the names Gothart and Neithardt are more likely surnames. Although the artist's reputation was well established in his own lifetime his work was overlooked until the late nineteenth century. Many of his works were attributed to his contemporary Albrecht Dürer but, unlike Dürer, his art was not influenced by Renaissance classicism. The styles of the two artists are quite different, Dürer absorbed the lessons of the Italian Renaissance while Grunewald's work displays the expressive intensity of the late medieval period. Very few of Grunewald's work survives, only around ten paintings are attributed to him, (although around thirty-five drawings survive), all have a religious theme, many are recurring graphic scenes of the Crucifixion. 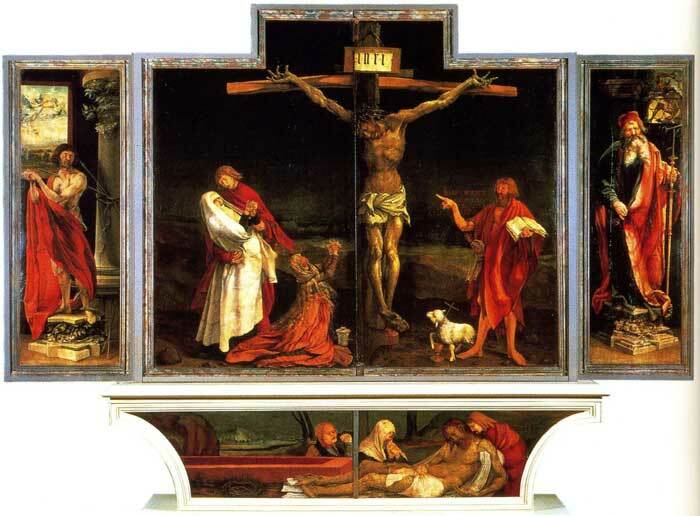 The Isenheim Altarpiece is Grünewald's most famous work. 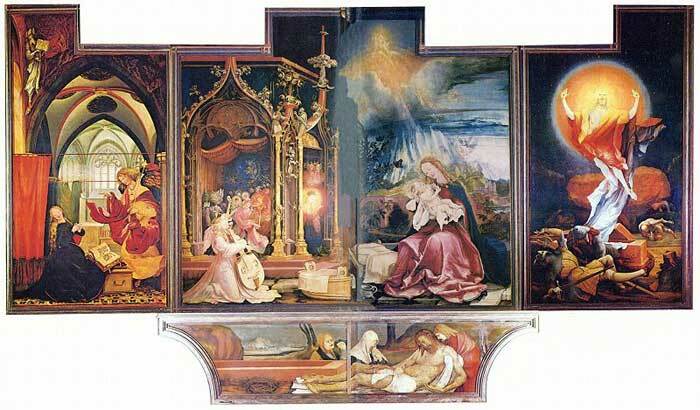 It was painted for the monks of the Monastery of St. Anthony in Isenheim near Colmar. Its complex structure can be opened to reveal three different scenes. The first state (above) centres on the Crucifixion, the images on the wings are St Sebastian and St Anthony. The predella (the step on which the altar stands) is decorated with a Lamentation of Christ, the same scene is also present in the second state. The second state centres on Mary bathing the infant Jesus accompanied by a choir of Angels. The wings are decorated with scenes of the Annunciation and of the Resurrection. The Resurrection is often used as a stand-alone example of the artist's work. The third innermost view has side panels showing The Temptation of St Anthony and The Meeting of St Anthony and the Hermit Paul. 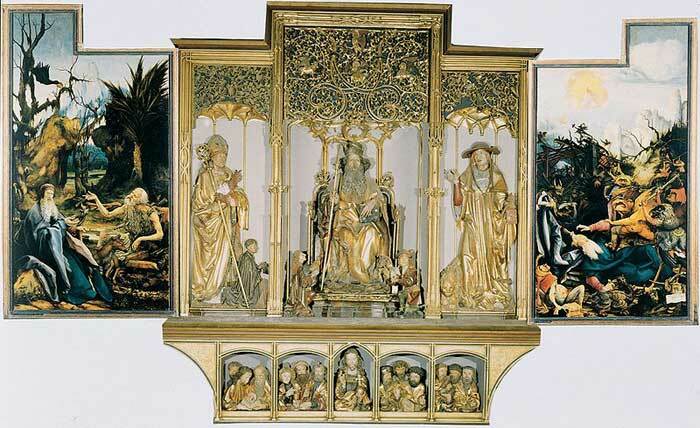 The centre panel is a wood carved, gilt decorated, altarpiece by Nicolas Hagenau from an earlier date of c.1490. 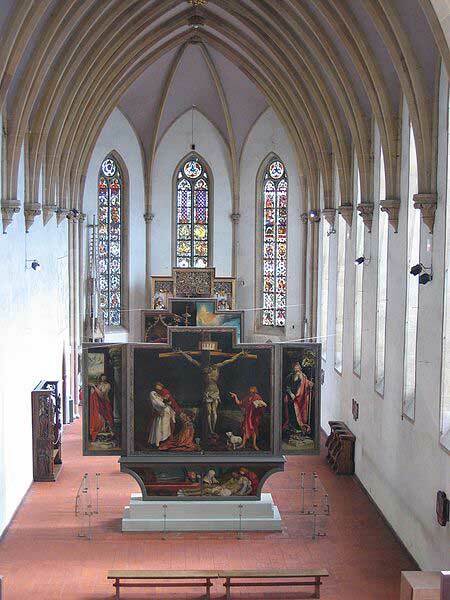 This Photograph of the Altarpiece in the Chapel of The Unterlinden Museum, France, shows the panels separated and displayed to great effect. The scale of the work becomes clear when viewed in relation to the size of the Chapel. Photo by Claude Le Berre Selestat, France. This late work illustrates the artist's recurring theme of Christ on the Cross. 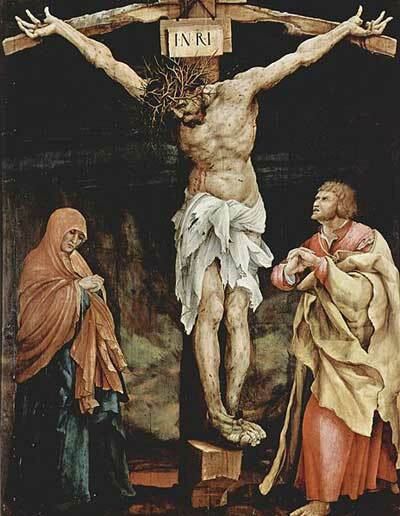 The image of Jesus is almost identical to the crucifixion scene in the Isenheim Altarpiece. This is no sanitised version of the Crucifixion. The tortured body of Christ conveys the pain and agony of a man close to death, nailed to the cross his wounds bleeding from thorns and beatings. The disfigured, twisted body, with hands outstretched to the heavens, expressively lay bare the gruesome reality of Christ's unimaginable suffering.